The Best Workout Plan for Bigger Arms! Men and women of all ages strive to get bigger arms, although many can succeed in creating large muscles through supplements like creatine, many also fail or create muscles imbalances. Today you will learn how to create bigger arms for beginners without the need of supplements as well as learning to create well developed muscles. The second exercise that you will do is for your triceps. Fun fact, your triceps actually make up around two/thirds of your arm. When training your triceps, you will need to pay more attention to technique rather than weight. This can allow you to better stretch your arm which will ultimately create a better exercise for your triceps. This exercise is called Sitting Dumbbell Overhead Tricep Extension. To perform this exercise, you will need to remain seated on a bench and then interlock your hands around one dumbbell over your head. Once you have done the first step, you will slowly lower the dumbbell until it hits the back of your neck. Once the dumbbell is lowered all the way down, you will need to raise the dumbbell back up without ever locking your elbows. You will then do this exercise for 5 sets of 8 reps. There is a diagram below if you need anymore explanation. The third exercise of six different exercises for your arms is Standing Dumbbell Curls. This exercise is a great way to hit your entire arm. With 4 sets of 10-12 reps for each arm your arms will feel dead afterwards. To perform this exercise, you will need to get two dumbbells that will challenge you towards the end of each set. Once you have done this, you will slowly curl one dumbbell while you stretch out the opposite arm to work your tricep. As you will find, you may need a longer break in between sets to allow for better recovery for the next set. The diagram for standing Dumbbell curls is below. 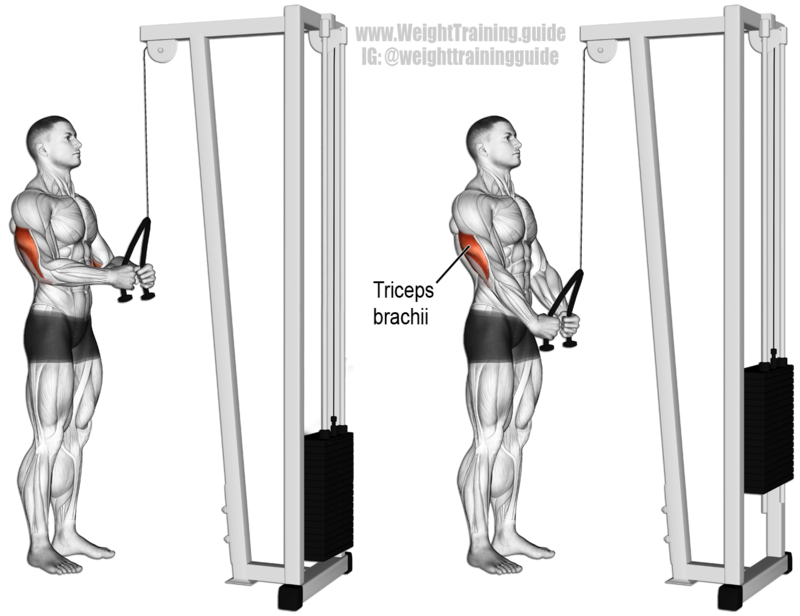 The fourth exercise is for your triceps. This exercise will tax your arms in a way that you probably haven’t felt before. This exercise is called Cable Rope Tricep Extension, and you will perform this exercise for 1 set of 15 reps, then 2 sets of 12 reps, and finally 1 set of 8 reps. The key to this exercise is great technique, you will need to keep you back straight while you slowly pull the rope down without moving your elbows with it. For each rep, you will need to extend your arm as far as possible and then slowly come back up. The diagram for cable rope tricep extension. The fifth exercise that you will perform during this workout will target your biceps again. This exercise is 3 sets of 8 reps and then 1 set till failure; the exercise is called Standing Straight Bar Curl. Most people know how to perform this exercise, but many people who do perform this exercise will incorrectly lift the weight. To correctly lift the weight you will need to hold your elbows against your side to not move them behind your back. Then you should lift the weight trying to only use your biceps with limiting the your amount of movement in your body. The diagram for standing straight bar curls is below. The final exercise is for your triceps. This exercise will end your workout nicely with just 3 sets of 8 reps. The final exercise is called Lying Barbell Skull crushers. This exercise should be done very slowly, as you hoist the barbell overhead you should slowly lower the barbell limiting your elbow movement. Once you are two inches away from your face, you will then raise the barbell back up and stretch your arm as best as possible. The diagram for this exercise is below. I hope that after reading this you can better your arm training and allow yourself to get stronger and create well balanced arms. Thank you for reading.